We are aware of the numerous roles Jamie Lee Curtis has played in her career. Your favorite might be Helen Tasker in True Lies, Wanda Gershwitz in A Fish Called Wanda, or Laurie Strode in Halloween. However, Jamie Lee Curtis has found her roles of mother and children's author much more significant. In a September 2010 article in USA Today, she spoke of the importance of being a mom, "Whatever life brings to me, no matter what or how far I reach out into the universe, the only change that really matters in my life is the feelings that are with my family, my children." In the following embedded video from Parents TV, Curtis described writing children's book as, "The best expression I have ever been able to have in my life." Jamie Lee Curtis writes books because "I see things. Writing books is my way of putting into words what I see and hear." In an article from HarperCollins she described the inspiration behind many of her books. Her first book When I Was Little: A Four-Year-Old's Memoir of Her Youth came from her own daughter expressing she was no longer little. Curtis adopted both of her children which was the inspiration behind Tell Me Again About the Night I Was Born . It is told from the viewpoint of an adopted child. Another inspiration came from a time at a birthday party when a storm caused a little excitement and a child let a bunch of balloons go. She overheard a child ask her mom, "Where do balloons go?" and that lead to Where Do Balloons Go? An Uplifting Mystery . Jamie Lee Curtis and illustrator, Laura Cornell have created nine books together. We were able to read six of those between the library and our own collection. 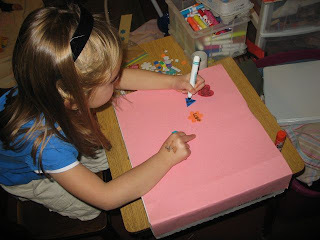 We went to JamieLeeCurtisbooks.com and found loads of activity ideas. My daughter decided to make a window decoration after reading My Mommy Hung the Moon and a personal control panel after reading It's Hard to Be Five: Learning How to Work My Control Panel. Both crafts were very simple, yet enjoyable for my daughter. 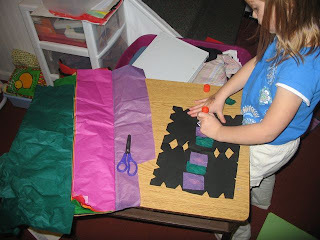 To make the window decoration we only needed black construction paper, tissue paper, scissors and glue. For the control panel we covered a box with construction paper and my daughter used foam stickers, paper, and markers to make her buttons. It was fun to see her push buttons and then do what it said. I liked the "happy" button! Hmmm.....I wonder if it will work if I push the button when she is having a difficult moment. 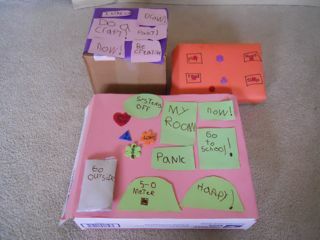 Below are the finished control panels made by my children. My son saw my daughter's control panel and had to make one of his own. Of course, she then had to make another. There is never-ending competition at our house. She liked the second control panel the best because it had buttons that made her be creative! 6. Jamie talks with CBS Early Show about "I'm Gonna Like Me"
Ironically, I was actually eating an Activia yogurt when I was researching for this post. 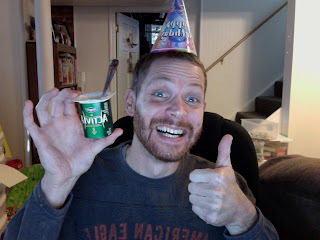 So, I donned a party hat for the occasion! Curtis currently is the spokeswoman for the product. Yes, I do need to get out more! Yeah, maybe you should get out more! LOL I'm just kidding...that's hilarious. I love your kids "control panels", and completely understand the competition factor with brothers and sisters. Even with my little ones it's already started. I've never read any of Jamie Lee's books, but may have to look into it. I'm not normally a huge fan of "stars" writing books, but this may be a little different. Great post!